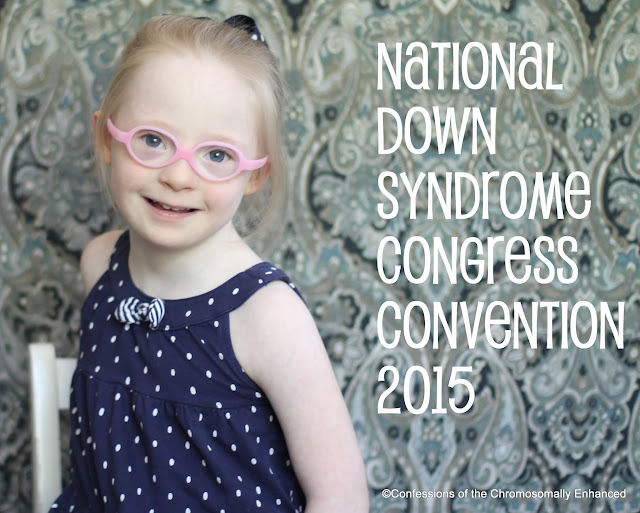 It's finally here: A post about our incredible weekend at the National Down Syndrome Congress Convention 2015! What is the convention all about? It's a fun-filled weekend at a luxurious resort where top experts in the field host seminars on topics related to Down syndrome. There's something for everyone at the NDSCC because they have a customized experience whether you're a parent, a sibling, an adult sibling (yeah, this whole thing provided massive confusion for me and made me want to clone myself more than once), a parent of a child with a DS-ASD dual diagnosis, a self-advocate (individual with Down syndrome), and the kids (childcare and activities are included). Workshops covered topics related to ALL ages including prenatal testing, feeding, communication skills, gross motor skills, fine motor skills, success in the classroom, IEP's, inclusion strategies, behavior, employment, dating and relationships, higher education, independent living, and MORE. Seriously, Folks: Just glance through this Workshop Schedule (Click HERE) and you can see why I wanted to clone myself. I wanted to attend all of them! Travis and I touched down in Phoenix on a beautiful 115 degree summer day - Oh! Don't worry, it's a dry heat (Mmmm Hmmmm...) - and the rental car agent handed Travis the keys to a Dodge Charger. He slid across the hood, and lowered himself in through the window and we were off! 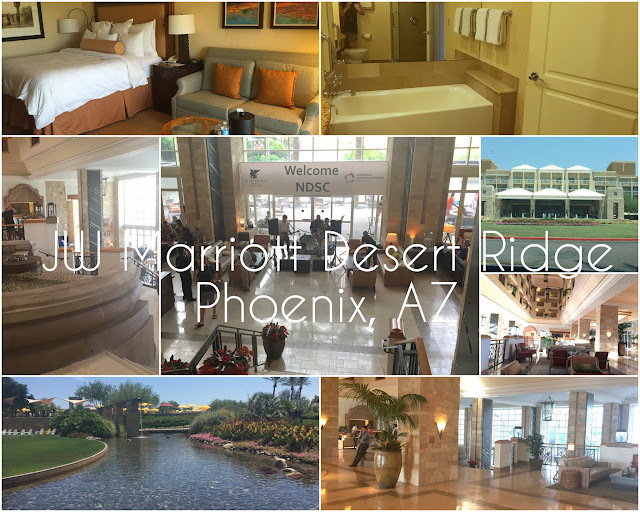 When we arrived at the JW Marriott Desert Ridge, I was blown away by what a beautiful resort it is. My pathetic cell phone pictures don't do it justice; it was first class all the way! 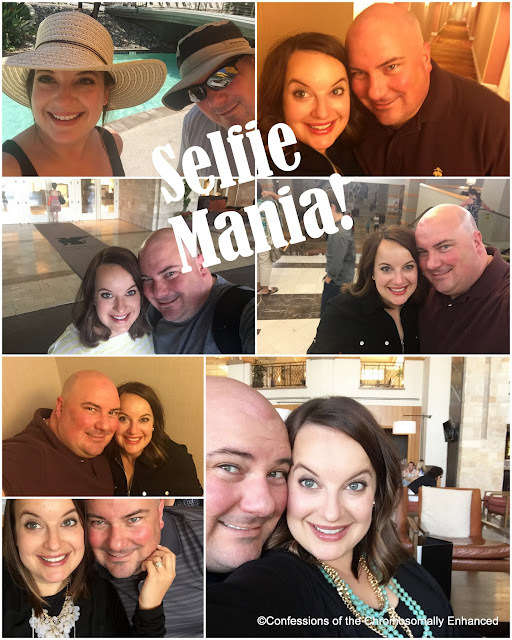 Footloose and child-free, Travis and I got down to the business of vacation! We set off to explore the resort - particularly the pool. Let's face it, the pool is the only place you want to be on a 115 degree day. In the evening, the NDSC had events and mixers planned - some were for parents, others for kids. But even just hanging out in the hotel lobby provided a great opportunity to meet all sorts of wonderful members of the Down syndrome community. The lobby was where I got to meet my Down syndrome sibling idol, Dr. Brian Skotko (I've blogged about his work HERE, HERE and HERE). The sight of him got me truly starstruck. After some encouragement from Travis, I walked up to his table and blurted out "I love you!" Yes, my nerves got the better of me and I led with a proclamation of love...to a total stranger...followed by an introduction to my husband. It was all kinds of awkward. It was also in the hotel lobby where Travis and I had the pleasure of striking up a conversation with this lovely lady, Global Down Syndrome Ambassador, DeOndraDixon. You may recognize her from Jamie Foxx's "Blame It" video (Click HERE). Jamie Foxx is a Down syndrome advocate as well, and he's DeOndra's brother. In addition to having killer dance moves, DeOndra is smart, sassy, and downright hilarious! She took a liking to Travis and complimented my taste in men. Then she reassured me not to be threatened because she doesn't pursue married men. Good to know, DeOndra. Let me tell you, Folks, I could have hung out with her all night! I hope our paths cross again. And while I didn't actually get to meet him, the one and only Tim Harris was at the convention. He gave a phenomenal speech - talk about a gift for public speaking and engaging a crowd. You can read more about Tim HERE. I met so many other incredible people - too many to reference individually - but one more stuck out in my head. Her name was Mary Therese and she was a young lady with Down syndrome. She came and sat across from where Travis and I were seated in the lobby while her Dad used the restroom so we struck up a friendly conversation with her. She was poised, articulate, and just lovely. When her dad returned, we introduced ourselves and he remarked how it's so nice to be in an environment where he could leave his daughter to strike up a conversation with strangers and not have to be the least bit concerned about it. What a beautiful thing about our Down syndrome community gathering at the resort for the weekend. He told us all about Mary Therese - from learning about her diagnosis to the changes he and his wife made to ensure that she had the best education possible - including purchasing a house in a different school district. They fought for Mary Therese to be included in the mainstream classroom before that was common practice. Every weekend they worked with Mary Therese on the curriculum for the upcoming week. It was so inspiring to hear of a family so devoted with such faith in their daughter, disability notwithstanding. Mary Therese reminded me of an older version of Josie - they seemed to share personality traits - and that made me smile. We parted ways but all the way to dinner that night, I talked about Mary Therese and how wonderful it was to meet her. She touched my heart. It might sound strange but being in a resort with so many chromosomally enhanced individuals and the families and professionals that are so devoted to this community was my utopia. If we could all just move into the JW Marriott and live together forever, it would be so joyous for me. These are my people. We're all members of the same club and it's a privilege for me. I attended all sorts of awesome workshops and while it was difficult to pick a favorite, I would have to say that if I ever have the opportunity to see Dr. Dennis McGuire speak again, I'm going to jump on it. Dr. McGuire specializes in adults with Down syndrome and he was so funny and absolutely spot-on in all of his points. My favorite story that he told involved his wife running to the grocery store to get some food for a morning meeting she had at her office. There was a young lady with Down syndrome bagging her groceries. His wife was running late and she became a little impatient with the bagger's slower pace so she grabbed a few items from the belt and started shoving them in bags to try and help expedite the process. The young lady with Down syndrome looked up with the most offended expression, stopped what she was doing, and said "YOU PEOPLE are always in such a rush!" with an exasperated sigh. It was priceless because the bagger was right - ultimately, us chromosomally deprived people are the misguided ones - not the other way around. And when you've been a part of the Down syndrome community as long as I have, it starts to make so much sense! My other favorite aspect of the conference - and something I must completely commend the NDSC for - were the workshops focused on adult siblings. To be in a room full of adults of all ages who are interested in the same topics was so incredible. They even gave us an incredible "Adult Sibling Toolkit" packed with information about financial planning, adult transition, employment, mental health, and other important topics. I was part of a sharing session led by Embry Burrus, a speech and language pathology professor at Auburn University and an adult sibling of a big sister with Down syndrome. Ms. Burrus just lost her mother this year and her sister, Margaret, came to live with her. The experience was so new and raw for Embry, but her honest insight into the adjustment was so inspiring. I was moved to tears. After the sharing session, I went up to speak to her and to thank her for leading the session and for openly sharing her story, and she gave me a copy of her book, Mama and Margaret. It's a sweet and funny memoir detailing her and her sister, Margaret's, upbringing in a traditional Southern family. Their mother was a strict, no-nonsense, "Steel Magnolia" who was a fierce advocate for Margaret in an era before resources were widely available to guide new parents of children with Down syndrome. The book is filled with funny and heartwarming anecdotes. If you're looking for a fun and touching read, check it out. I hope someday Ms. Burrus will write another book about becoming Margaret's guardian and the adjustment that followed. And of course I would be remiss not to mention the epic dance that is the highlight of the conference for all involved. Growing up in the Down syndrome community, I've had the good fortune of attending a few similar dances in my day and I know the excitement they can generate. Talk about a room full of uninhibited party animals, where no one is a stranger, and fun is the only goal. It's an unforgettable experience. Dance like nobody's watching, Folks. 1. Fellowship - Spend the weekend at a beautiful resort full of people who are rockin' an extra chromosome and those that love them. Make friends. Network. Share stories. Be inspired everywhere you turn. 2. Learning - This is the place where the latest information and resources about Down syndrome are disseminated. The leading experts in the field are here to give you all the knowledge you need to help your loved one with Down syndrome lead the most healthy and fulfilling life possible. 3. Resources - A whole section of the hotel was converted to an exhibit hall where vendors distributed information and resources customized for people with Down syndrome. Learn about organizations devoted to helping individuals with special needs, higher education opportunities, health and fitness gear, and academic materials and more - all in one spot! 4. Fun - Some conferences are stuffy and boring that just drag on and on. You know what I'm talking about - where you spend an exorbitant amount of energy strategizing how you can sleep while looking like you're thoroughly engrossed in the presenter's lecture? This isn't like that AT ALL! It's a fast-paced, dynamic, high-energy weekend. It will wear you out in the best possible way - kind of like having kids. And when it's all said and done, you reflect on that whirlwind and you think 'Boy! That. Was. AWESOME!' and you start planning when you an attend your next NDSCC. Let me conclude by thanking my wonderful husband, who knew how much this opportunity meant to me so he worked his magic at the last minute, after a hectic move into a new house, to get us to Phoenix. I'd like to thank my dear friend (and Josie's future mother-in-law), Kristin, who persuaded her husband to join in the fun and be Travis' golf buddy all weekend. 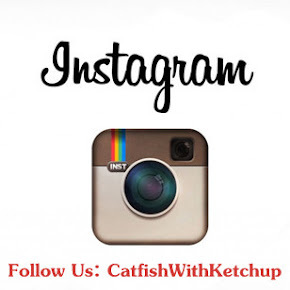 Thanks to all of the awesome blog readers and Instagram followers who came up and introduced yourselves to me. It was a joy to meet each of you. And the biggest thanks goes to Mama Hop and Aunt Leanne (and Miss Lisa) for spending the weekend lovingly caring for our three babies. I know it's no small feat and I'm so grateful. It looks like you had a great time! So jealous! I was dying to go since it was being held only a few hours away from me, but my cousin's wedding was the same weekend :( Maybe next time!